Within days of his inauguration, George W. Bush is almost certain to face a new confrontation with the government and people of Puerto Rico over the U.S. Navy's 60-year-old bombing practice range on the island of Vieques. The Vieques dispute, which briefly attracted major media attention in late 1999, promptly disappeared from most radar screens in this country after President Clinton reached a compromise agreement on January 31 with Puerto Rican Gov. Pedro Rossello. But the controversy never went away for the 3.8 million U.S. citizens of Puerto Rico who inhabit this nation's last major colonial possession. And unless President Clinton acts before Bush is inaugurated, the dispute may become the new president's first foreign policy crisis. Vieques is the most glaring example today of an imperial arrogance that has been part of the Navy since American sailors first began patrolling foreign waters in the early 19th century. It is also the most recent example of a well-established but little examined tradition in the Navy of top officers challenging civilian control. At least that's the conclusion reached in the new book Foxardo 1824 by Jesus Davila, one of Puerto Rico's most respected journalists. 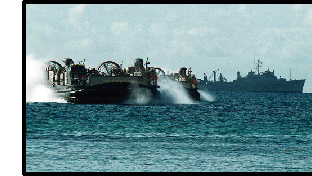 Ships landing at the Camp Garcia Naval Base on Vieques. earliest heroes, Commodore David Porter, led 200 sailors in an unauthorized surprise attack on the Puerto Rican town of Fajardo. Porter's subsequent court-martial for that incident created a national furor, with the proceedings of his trial front-page news for months, and with Porter orchestrating an extraordinary campaign to win public sympathy, including publishing a book in his own defense. Prior to the court-martial, he even leveled criticisms against President John Quincy Adams and the secretary of the Navy. This prompted the Navy to add insubordination to its list of charges against Porter, turning him into the most prominent 19th-century example of a naval officer defying civilian authority. But before delving further into the Porter's amazing story and how it relates to the Vieques controversy, we first need to understand what is happening right now with Vieques. The Clinton-Rossello agreement ended all live bombing on Vieques and provided a three-year transition period for the Navy to find another practice site. However, it permitted the Navy to conduct a reduced number of training exercises with inert bombs and dummy ammunition; and it called for a complete Navy pullout by May 2003, only if the people of Vieques voted for that withdrawal in a referendum. The agreement stipulated that the Navy would decide the date of the referendum--which has been set for November 6, 2001--and would provide $40 million in development assistance to Vieques, presumably to win support for being allowed to stay. It also called for 8,000 acres of Navy land to be turned over to the government of Puerto Rico. From the moment it was announced, the agreement faced widespread criticism, both in Puerto Rico among those who wanted an immediate Navy withdrawal, and in this country from the Navy's staunchest supporters in Congress who opposed giving up the range. On the island, several huge demonstrations were organized by a coalition of church groups, and hundreds of people were arrested throughout the year for civil disobedience on the range in attempts to disrupt maneuvers. But it wasn't until Election Day that the full impact of the Clinton-Rossello agreement became clear. While throughout the United States, most people were fixed on the presidential race and the Florida recount, few noticed that down in Puerto Rico, opponents of the Vieques agreement had swept to an amazing victory. Rossello's pro-statehood New Progressive Party, which had backed the agreement, lost virtually everything--its majority in both houses of the Puerto Rican legislature, the governor's mansion and the post of resident commissioner, the island's nonvoting delegate to the House of Representatives. an immediate withdrawl of U.S. forces from Vieques. 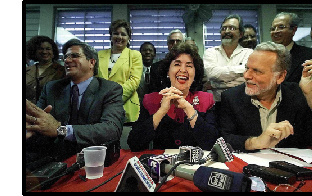 first woman governor, and the polls showed that her strong opposition to the Vieques agreement was what provided her margin of victory. Within days after the election, Calderon met with Carlos Pesquera, head of the New Progressive Party, and Ruben Berrios, head of the Puerto Rican Independence Party, and the three leaders sent a joint letter to Clinton calling for an immediate withdrawal of the Navy from Vieques. Calderon promised that her first official act as governor would be to organize a referendum separate from the Navy's that would include the immediate withdrawal of the Navy as an option. In effect, she declared the Clinton-Rossello agreement dead. This training that is going on now is subsequent to an agreement. Now the Republicans in Congress broke the agreement, and instead of giving the Western part of the island to Puerto Rico, gave it to the Interior Department to manage. If I can't find a way to give that island, the western part of the island, back to the people of Puerto Rico, and to honor the agreement that the government of Puerto Rico itself made with the support of the local leaders, including the mayor of Vieques, then the people of Puerto Rico I think have a right to say the federal government broke its word, and the training has to stop right now. I think the training should stop because the people don't want it there. But we need a place to train, and we are in the process of finding another place. If the president, as commander-in-chief, supports the majority view in Puerto Rico that the Navy must withdraw, then why is the Navy scheduling a referendum on the question? The answer comes from Clinton himself. New York labor leader Dennis Rivera, who has spearheaded the pro-Vieques movement in the city's Puerto Rican community, has met with the president several times over this issue. According to Rivera, Clinton told him recently that the White House was threatened with "several resignations" by Navy officials if he ordered an immediate closing of the bombing range. At least one White House official has confirmed the resignation threats to me. Other Clinton aides have been saying privately for months that no matter how the president may feel personally about Vieques, the Navy brass wields far more influence with Capitol Hill on the issue, especially since Congress must approve all transfers of military bases. In the Senate, Virginia Republican John Warner, head of the Armed Services Committee and a former secretary of the Navy, has been among the strongest opponents of giving up the Vieques range. In effect, the admirals and other Pentagon brass have quietly and successfully defied the commander-in-chief on Vieques for more than a year. But this type of defiance is not new for the Navy, as Davila discovered while researching Foxardo 1824. The book, which was published in Spanish in June and is already in its third printing, is a product of Puerto Rico's nonprofit Historical Journalism Project, a collaborative effort of the Catholic Church and the Ateneo Puertorriqueno, the island's oldest private academic and literary forum. Davila spent nine months studying military archives in the United States, Puerto Rico, Mexico, Spain and Venezuela, in an attempt to piece together a historical picture of Navy operations in the Caribbean, one that might explain why the admirals and generals in the Pentagon keep insisting that Vieques is the only island in the Atlantic suitable as a bombing and training site for American troops. In the process he came across the Foxardo Affair. When the incident occurred, David Porter was already a naval hero having distinguished himself in both the Barbary War and the War of 1812. His daring voyage into the Pacific to attack British ships during the latter conflict led Washington Irving to extol him as "our modern Sinbad." By 1824, Porter had been promoted to Commodore of the Gulf of Mexico, West Indies and the Coast of Africa, and the main job of his squadron was to drive pirates from the Caribbean. That November his squadron was stationed in St. Thomas when Porter learned that one of his lieutenants had been arrested in the nearby Puerto Rican town of Fajardo and deported by Spanish troops. Porter promptly gathered several of his ships and landed 200 men at Fajardo's port. There, he destroyed two gun batteries and threatened to raze the entire town unless the local mayor produced those who had detained his lieutenant and made the culprits apologize. When a contingent of Spanish troops arrived, Porter's men retreated. The Spanish government, which was then an ally of the United States, lodged a protest that led to his court-martial. The attack on Fajardo ended up being called the "Foxardo Incident" by Navy Brass who routinely misspelled Spanish names. Porter published a lengthy defense of his actions in 1825, in which he claimed that he attacked the town while pursuing pirates who had stolen goods from merchants in St. Thomas. Puerto Rico was a notorious haven for pirates, he insisted, one that Spain could not control, and that gave the United States the right to punish the island. The Commodore called on the public to choose between him and the government. As for Puerto Rico, Porter wrote: "It is the duty of all nations to unite with us, to treat the people of Porto Rico [sic] as the enemies of the human race." But Judge Advocate Richard S. Coxe, who prosecuted Porter, reached a far different conclusion in his public report. According to Coxe, the lieutenant whose arrest had touched off the incident had landed in Puerto Rico in civilian clothes without proper identification and had been properly expelled by Puerto Rican authorities. As for Porter, Coxe concluded that his story was so full of contradictions as to be unbelievable, and that the Commodore had no justification or authority to launch his attack. Porter was convicted, but because of his war record, he was slapped with only a six-month suspension. The scandal proved enough, however, to end his Navy career. The bitter Commodore resigned, moved to Mexico and enlisted in the Mexican navy as commander of its fleet. The disgraced Porter took his son, David Dixon Porter, with him to Mexico. Years later, David Dixon Porter returned to the United States and followed in his father's footsteps by joining the Navy, becoming a hero during the Civil War along with his adopted brother, David Farragut. The two brothers, in fact, were the first two admirals of the U.S. Navy. After the Civil War, David Dixon Porter took command of the Naval Academy at Annapolis, Maryland. He is considered the man who turned the school into the elite institution is is today, and is recognized as the founder of the Navy's historical tradition. He went on to serve as undersecretary of the Navy and its chief administrator. Meanwhile, Farragut was named chief of naval operations and became the mentor of Alfred T. Mahan, the Navy's most influential theoretician during the age of imperialism. Neither brother, however, forgot how their father had been treated by John Quincy Adams and the civilian politicians of his day. In a biography written years later, David Dixon Porter insisted that his father had fought for the national good but had been subjected to political persecution. Mahan painted a similar view in a biography he wrote of Farragut. To this day, the textbooks on Naval history used at Annapolis portray David Porter in the Foxardo Affair as the victim of civilian leaders who targeted the brave Commodore for what was at best over-eagerness. Such revisionist history has been taught to each new class of Annapolis students since the late 19th century. When a squadron of Navy ships bombarded the port of San Juan in May 1898 during the Spanish-American War, the ship assigned to lead the bombardment was none other than the U.S.S. Porter. After U.S. troops occupied Puerto Rico during that war, Navy officials immediately began lobbying to set up a base just south of the town of Fajardo and west of the island of Vieques. The Navy did not get its wish until World War II, when Roosevelt Roads Naval Base and the Vieques training range were established. Ever since then, the Navy has used military exercises at Vieques as the final graduation ceremony for its officers as they head for the real world of combat. So what does all this forgotten naval history have to do with the present Vieques controversy? We often forget, as Jesus Davila reminds us, that institutions are built by people, and the traditions of those institutions are passed from one generation to the other by the men and women who compile the stories and make the official record. In the case of Puerto Rico and the island of Vieques, the tradition reaches far back to the early days of the Navy itself. In a strange way, one that most Americans barely understand, Puerto Rico's modern history always has been entwined with that of the Navy. But a civilian commander-in-chief, whether his name is Clinton or Bush, must learn, like John Quincy Adams once did, to separate fact from fiction, to separate the interests of a nation from the obsessions of its admirals. On January 22, two days after Bush's inauguration, the Navy has scheduled new maneuvers for its Vieques training range. In Puerto Rico, where people respond to a different tradition, more protests are expected, only this time the newly elected island government will be on the side of the protesters. President Bush thus will face his first foreign test near the same Puerto Rican town where Commodore Porter failed his in 1824.